for lectures and workshops. Please click this Link for more. This event is part of the Hibla ng Lahing Filipino Travelling Exhibition now on display at the UH Hamilton Bridge Library until November 17, 2018 from 9:00 am to 5:00 pm and Sundays from noon to 10:00 pm. Co-Sponsors: UHM Center for Southeast Asian Studies, Center for Philippine Studies, Department of Anthropology & Museum Studies Graduate Certificate Program. holistic and conceptual conservation frameworks. Dr. Labrador holds a PhD in Anthropology, Cambridge University, and an MA in Museum & Gallery Management, City University, London, UK. She is currently the Chief Curator & Head of Collections Management, National Museum of the Philippines. Details about this lecture are found by clicking this Flyer . Is there Sexism in Tagalog Language? Venue: Max of Manila, Dillingham Blvd. Dr. Pia Arboleda, currently Director of the UH Center for Philippine Studies, will give an interesting lecture on the perpetuation of sexism in the Tagalog/Filipno language. 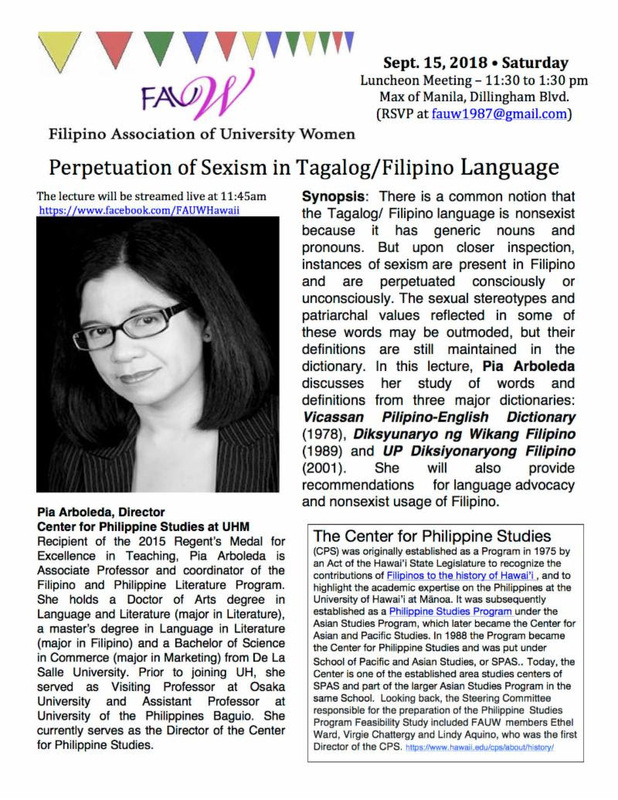 Based on her study of three major Tagalog/Filipino dictionaries, she will present her analysis of the presence of and continuing sexism in this Philippine language. Interested parties may contact and send RSVP to fauw1987. You may also listen to the lecture streamed live at https://facebook.com/FAUWHawaii.